The Sony Xperia Tablet Z is pretty much the complete package. A fantastic slender, lightweight design topped off with a great screen and clever features makes it the best 10-inch Android around. The Sony Xperia Tablet Z is a super-light device designed to take on the iPad with a quality screen and innovative features - but is the price too high? But when it comes to tablets, the world of Android is a funny old place.. There have been plenty of pretenders, but not really one that stands out when it comes to market share in the way the iPad does. And it's a wrong Sony is determined to put right with the Xperia Tablet Z.
Sony has tried before - the Xperia Tablet S, Sony's most recent foray, was a decent if uninspiring effort. But as with others, it failed to stand out in a world full of challengers. Time for the Sony Xperia Tablet Z to improve on this. The first thing we noticed when we took the Sony Xperia Tablet Z out of its box was how beautiful it was. We don't want to sound gushing, but as gadget lovers, we have unboxed a lot of devices. Yet it's on only a few occasions that we've taken something out of its box and instantly been smitten with it. We're thinking of the way we felt with the first iPhone (and the iPhone 4), the Nexus One, the iPad 2 and the HTC One. Certain devices just have the power to evoke a strong reaction that makes you feel instantly transfixed. The Sony Xperia Tablet Z definitely comes under that category. And the accessories (like the official case/stand, for example, if you have more money than sense) won't be available until-mid June. Unsurprisingly, Sony says this is its most pre-ordered tablet yet. But it won't come cheap. The 16GB Wi-Fi-only model will set you back £399/US$499.99/AU$539, the 32GB Wi-Fi version costs £449/US$599.99/AU$649 and the 16GB LTE/4G model is priced at £499/AU$679 (US price not currently available). That's exactly the same as the equivalent iPad 4, and roughly what you'll pay for a Samsung Galaxy Note 10.1. Make no mistake, Sony is making a statement here: "Our products are just as good as Apple's, so don't expect them to be cheaper." There are several reasons why we became instant fans. Firstly, looks: the Sony Xperia Tablet Z doesn't try too hard. There are no uber fancy bells and whistles here. To all intents, it's a simple black rectangle. But what a rectangle it is. Highly glossy glass on the front made from toughened, scratch-resistant glass. It looks (intentionally) like a larger version of Sony's already stonking Xperia Z phone with one minor difference - the back of the tablet isn't glass like the phone, but a more matt-style polycarbonate makeup. And aside from the standby and power buttons on the side, there are no others. As per Google's direction, all navigation is done via the screen's software buttons. Then there's the thickness. Or, rather, the lack of. This is currently the thinnest tablet on the market - and it really shows. If you think the iPad 4 is respectable at 9.4mm (0.37 inches), then you'll really be blown away at the Sony Xperia Tablet Z's 6.9mm (0.27 inches). In terms of overall footprint, it's slightly different, clocking in at 266mm x 172mm (10.5 x 6.8 inches) compared to the Apple offering's 241.2mm x 185.7mm (9.5 x 7.3 inches). But the other thing you'll notice is just how light it is. Weight is one of the tricky ones, with frequent complaints that tablets such as the iPad become too heavy to hold for long periods of time. The iPad 4 tips the scales at 662g (1.46lbs) and even the Samsung Galaxy Note 10.1 is no feather at 600g (1.32lbs). The Sony Xperia Tablet Z trumps them both at 495g (1.09lbs). This really is one of those devices you have to experience to appreciate. Pictures and YouTube videos just don't do it justice. Added to that is the fact that the Sony Xperia Tablet Z, like the Sony Xperia Z phone, is water and dust resistant. This is a tablet you can comfortably take into the bath and not worry about. It's slightly disconcerting doing so, since every fibre of your being is telling you not to dunk it in the water, but provided you make sure the waterproof plugs are in the sockets, you'll be fine. In fact, the only way this doesn't work is when trying to swipe underwater. The screen registers all kinds of movements, so you have to take it out and dry the screen to really get it to register screen taps. Mind you, if you're likely to be playing Fruit Ninja underwater, you probably need to have a word with a doctor. For watching movies in the bath or at the bus stop in the rain, you'll be fine. If you try and run water on the display, get ready for a panic, as it registers a million taps and opens every app under the sun, making you worry that the tablet has a plug open and water is getting inside. It's not, stay cool. However, we do wonder if waterproofing this tablet is anything more than a gimmick. Yes, you can use it in the bath without worrying, or get egg on it while cooking. It makes it feel more rugged, indeed. But do you need a tablet to do that? Without the covers it might feel like a more slick product, and that's something we would love to see. It could possibly do away with the angular corners too, which is a real design problem in our eyes. We're not totally sold on the dust resistance either. Yes, it means that dust won't get in beneath the screen, which used to be one of our main bugbears on devices of old. But the Sony Xperia Tablet Z does have a ridge all the way around the edge that seems to attract lint. You can clear it with a blow or a blast from a vacuum but it'll just come back. And don't get us started on fingerprints - this is a magnet for them. And the screen is another area you'll want to know about. We weren't bowled over by the displays on more recent devices such as the Samsung Galaxy Note 10.1 or Samsung Galaxy Note 8.0 because of their resolutions. The trouble is once you've experienced a sharpness like Apple's Retina displays, nothing else can really live up to your expectations. We used an iPad mini recently and it felt almost third world that we were able to spot pixels on websites and ebooks, even if it was less of an issue with photos and videos. The same could be said of Sony's Xperia Tablet S.
But there are no such issues here. 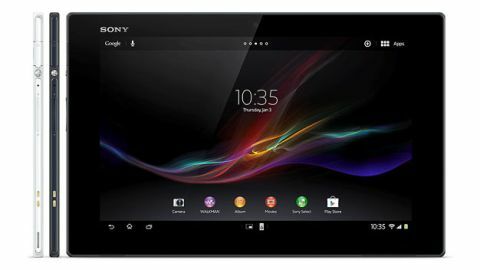 The Sony Xperia Tablet Z sports a Full HD display - 1200 x 1920 pixels spread over its 10.1-inch screen, giving a pixel density of 224ppi. It's not the sharpest out there - that honour is held by the Google Nexus 10 and its staggering 299ppi for the larger tablet and 323ppi on the New Nexus 7 - but even still the Sony Xperia Tablet Z excels with it's clever screen processing technology. We spot pixels for fun and can categorically say that this is a super sharp display that we were more than impressed with. And surprisingly in side by side comparisons, it bested the Google Nexus 10 and was every inch the equal of the iPad 4 - beating the latter when it comes to movie watching simply because it has a more widescreen ratio. On top of that, Sony's equipped the Xperia Tablet Z with its Mobile Bravia Engine. A lot of the time this is all smoke and mirrors, using fancy new titles that add little to the experience. Not so much here, though. The Sony Xperia Tablet Z looks absolutely phenomenal, with photos and videos popping out of the screen brilliantly. Even on just normal tasks, like web browsing, the colour is spot-on. It's not too bland but also not overly colourful, which is a criticism sometimes levelled at Samsung. Whites look warm on the Sony Xperia Tablet Z, rather than yellow. There is little here we can criticise, other than the fact that the screen is sometimes too bright. We had the Sony Xperia Tablet Z set to auto-brightness, but found ourselves often having to manually turn it right down to the lowest possible setting. Maybe Sony thinks we're all half blind, but sometimes less is more. One other observation we must point out here is how much better the screen viewing angles are on the Sony Xperia Tablet Z compared to the smartphone equivalent. On the tablet, it's an LED-backlit LCD panel, while the Xperia Z phone ships with a TFT display. The phone screen is sharp and bright, but look at it anything other than dead-on and it looks more washed out than an old pair of jeans. You won't find this on the Tablet Z, where the viewing angles are much better, although the iPad does have a superior contrast ratio based on general usage. It's good to see, since this could have been a massive Achilles' heel, especially because you'd be more likely to share content with friends on a larger screen, watching movies together and so on. If you're a fan of movies, a microSD card slot is another big bonus here. Sony has stuck two fingers up at Google and its move to cloud-based alternatives, forcing people into 32GB or less of onboard storage. It means that you can buy a 16GB model and easily bump your storage up by an extra 64GB without breaking the bank. It's a big issue. Google assumes people are happy to stream from the cloud, but bearing in mind the space an OS and bloatware can take up and the fact that you have to install apps onto the internal memory, by the time you've added a few big ones like the GTA games, a couple of HD movies and a few songs, your allowance is shot. And if you're on a plane or a train and want to stream from your collection of 30,000 tunes, you're out of luck unless you've previously decided which ones to download to the device. That's why we remain fans of SD card slots, even if you disagree in some of the comments sections. Powering this beast - and making sure your movies all play without lag or stutter - is a Qualcomm Snapdragon processor with a quad-core 1.5GHz Krait CPU. Add to that 2GB RAM and you're on fire. Some early reports have claimed there is a slight lag on certain tasks such as swiping from screen to screen, though the same posters have added that installing another launcher such as Nova or Apex fixes the issue. We didn't notice much lag on our unit, and we really rinsed the Sony Xperia Tablet Z as much as we could. Occasionally it would take a couple of taps of the home button to go back to the main screen, but it wasn't often and it tended to be during CPU-intensive tasks. Either way, if those reports are true for some, it's to do with Sony's launcher rather than a hardware issue, so Sony will be able to fix this with an update. Powering the Sony Xperia Tablet Z you'll find a 6,000mAh power pack. While huge, it's not the biggest out there, bearing in mind the iPad 4's is nearly double the size at 11,560mAh and the Galaxy Note 10.1 offers up 7,000mAh. We'll go into how it performed in the Battery section of our review. Charging is done via a micro USB connection, which means you can use any other chargers you have lying around the house too, though you have to have a wall socket, since it won't charge off a laptop. Hard luck. We won't lie, the act of charging is a pain. For one thing, you have to take the waterproof cover out each time (this is the downside of having a waterproof tablet) - unless you're using the pricey official dock with charging contacts - and although high quality and secure, we can't help but wonder how long they will last. Add to that, this is not a quick charging device. Where you can plug an iPad in for a 10 minute power blast and be confident you'll gain a bit of juice for a quick jaunt, the Sony Xperia Tablet Z takes forever to charge up. We found it's definitely an all-night job. Slow doesn't come close to describing it.